Minister of State (Independent Charge) for Youth Affairs and Sports Col. Rajyavardhan Rathore has said that government gives lifelong pension under the Scheme of ‘Pension to Meritorious Sportspersons’, sportspersons who have won medals for the country in the international competitions only and have retired from active sports. 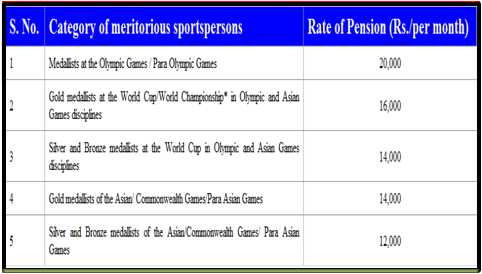 In a written reply in Lok Sabha today, the Minister said at present, 588 Sportspersons are getting pension. The rate of pension has been revised with effect from 1.4.2018. The rate of pension has been doubled of the rates of pension existing earlier. * World Cup/World Championship held once in four year only shall be considered.